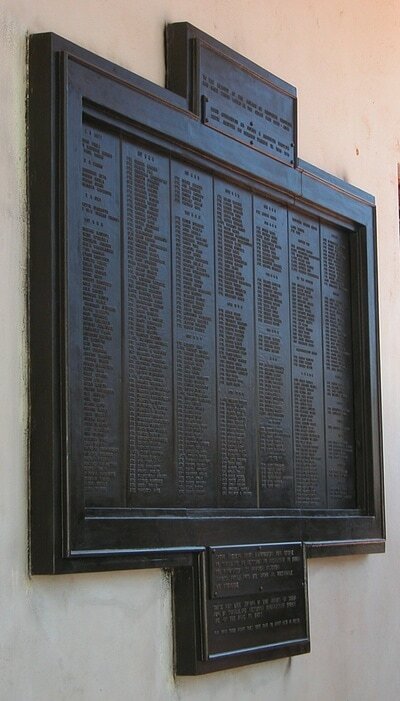 The Lusaka Memorial consists of a large bronze plaque fixed to the front wall of the Memorial Hall in the centre of the Burma Barracks, Lusaka. The Burma Barracks are situated approximately 2 kilometres from the British High Commission on the Burma Road, and the Army Camp can clearly be seen from the road. The Memorial was erected by the Northern Rhodesia Government to the memory of all African soldiers who died during the 1939-1945 War. The names recorded are those casualties of the Northern Rhodesia Forces who died in Northern Rhodesia whose graves are unmaintainable; plus the names of 2 Northern Rhodesia soldiers who died in Northern Rhodesia whose graves are not known, and 8 African soldiers who were not natives of Northern Rhodesia but who served in the Northern Rhodesia Regiment, who died in Northern Rhodesia and who have no locatable grave. The Lusaka Memorial is situated in a military base and permission to enter is required, prior to the visit, from the Zambia Ministry of Defence (Veteran’s Affairs). The total number of names is 126. Other personnel of the Northern Rhodesia Forces who died in other parts of the world are commemorated elsewhere.